The Annual Seminar is a weekend long event held each Spring in late April or early May. The venue alternates every 2 years between Central Oregon and the Central Coast. 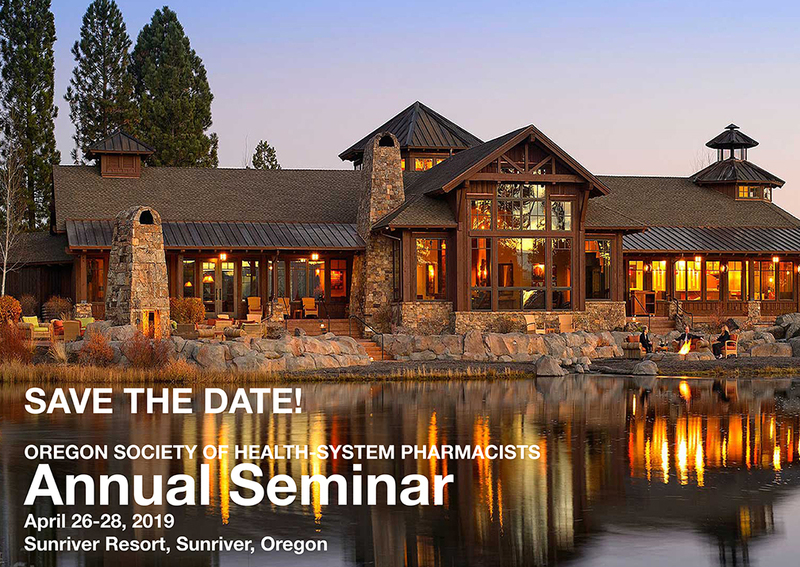 Annual Seminar delivers at least 15 hours of continuing education for pharmacists and technicians and serves as OSHP’s annual business meeting with open forum. CE topics may cover a vast array of interests including pharmacy management, leadership, student precepting methods, clinical practices, and law updates. Programming for pharmacy technicians and students specifically is also offered. Poster presentations allow members having completed research projects to share their results with colleagues from around the state. The Industry Exhibition allows conference attendees to connect with over 30 pharmaceutical industry partners. The Seminar is also organized to encourage professional networking and having fun. Participants are encouraged to attend the Welcome Reception and Awards Banquet; Run, jog, or walk in the Gary Claussen Memorial Run; take the opportunity to play golf on the adjacent course. Please contact the Annual Seminar chair if you would like to assist in organizing this fantastic event! Click here for details Coming!